One of the most popular touring cars racing series in the world is DTM; Deutsche Tourenwagen Masters or the Deutsche Tourenwagen Meisterschaft how it was originally called in the period from 1984 to 1985. The series was revived in 2000 and instantly became one of the fans favorite, especially in Germany after the entry was reserved exclusively for the German manufacturers. Many famous names tasted the racing in DTM, more or less successfully. Some of them were Formula 1 stars like Mika Hakkinen, David Coulthard, Heinz-Harald Frentzen, Jean Alesi and Ralf Schumacher. Frank Biela, Alain Menu, Laurent Aiello, Tom Kristensen, Lucas Luhr and other famous drivers have competed in DTM. In the terms of titles number it won’t be hard to say who was the most successful in the history of DTM, but it is important to know that the format of the competition changed over the years, so the demands on the track and drivers’ approach were different. This is our list of seven probably the best drivers in the DTM history so far. Dane and the father of another well-known driver Nicki Thiim was one of the best drivers in the early days of DTM. He won only one title, in 1986, driving a Rover Vitesse. Later in his career, Thiim drove for Mercedes. Except one title, Thiim in his records has DTM vice-champion title in 1992 while in 1990 he was third overall. During his DTM career, Kurt Thiim scored 19 race wins and 13 fastest laps. Canadian driver is the 2012 champion which is his best result so far, but Bruno Spengler was also twice the DTM runner-up (2006 and 2007) while in three seasons he finished in 3rd place overall. He started DTM career in 2005 as a member of Mercedes team but moved to BMW in 2012 before winning the title the same year. Spengler started in 131 races, scored 14 wins and 38 podiums, but also recorded 17 pole positions and 14 fastest laps. British driver is the 2005 champion and currently one of the longest servants in the series. He debuted in 2003 and since then he is a member of Mercedes’ teams with which he also has no less than four runner-up finishes, in 2004, 2009, 2010 and 2012. Gary Paffett holds a record of most wins in one season (5) in the single/feature races, scored in the year in which he became a champion. He started in 140 races, scored 20 wins and has 32 podiums in his DTM career. The two-time champion, in 2005 and 2009, debuted in DTM in 2000, the year of the series revival. He started driving for Opel but when the Russelsheim based manufacturer ceased the operations in DTM, he moved to Audi. German racer marked the first era of DTM when he won all of his three championship titles, one driving a Ford in 1988 and two with Mercedes (1992 and 1994). Klaus Ludwig scored a total of 37 race wins, which is the second best result in the history of the series, and 16 fastest laps and pole positions. It is important to know that Ludwig is a three-time winner of 24 Hours of Le Mans and 1998 FIA GT World Champion. Accomplished driver from Sweden is a two-time DTM champion, in 2004 and 2007. He is the series record holder in a number of podiums (75) and also has 23 race wins, 20 pole positions, which is is the second best result in the history of the competition and 12 fastest laps. 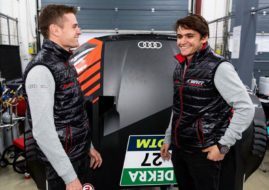 Since his debut in DTM in 2001, Mattias Ekstrom is driving for Audi. Except two championship crowns, he finished as a runner-up thrice (2005, 2011 and 2014) while in 2002, 2008 and 2015 he was 3rd overall. As a six-time champion, all with Mercedes, this guy is a true legend of DTM. He was also the series runner-up in 2002 and finished 3rd in 1992 and 1993. Bernd Schneider won his first title in 1995 and still is the only one who managed to defend it next year. When DTM started in its current format, Schneider was the first champion and again defended his title in 2001. In 2003, he won his fifth title while in 2006 he was crowned for the last time, before retiring at the end of 2008. Schneider holds DTM records with 43 race wins, 25 pole positions, and 60 fastest laps while he is second overall with 54 podiums. Some of those numbers could hardly be beaten in the foreseeable future.